Majik - Back into your Heart. Vinyl LP. Bleep. 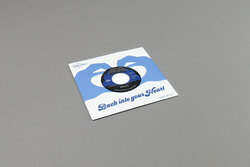 Melodies International continues on a roll with another great, belting soul reissue. Run by Floating Points and Cosmos Records employee Mafalda Daniel, the label is giving new life to both sought after holy grails and slightly overlooked heavy hitters. Both sides here are floor filling, feel good hits in the vein of Africano’s ‘Satisfactorize Your Mind’ etc. Sure winner if you’re a fan of Athens of the North and Euan Fryer’s deep digging. Official of course, and remastered for maximum club impact. You can trust these guys! B-side is our pick.